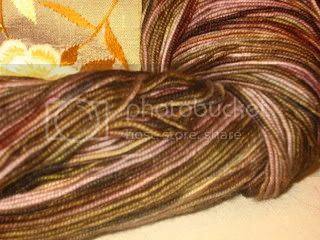 I mentioned in passing, quite some time ago, that one of my projects at the Baskets of Yarn knitting retreat this past March was entrelac. I've been knitting on it here and there since then. Want to see? Entrelac may be my new favorite thing. It looks SO neat when it's done -- I've always admired it, but was afraid to try it myself, so I'm glad I had the opportunity to take Margaret's wonderful class at the retreat. Had I attempted this on my own, I would have taken one look at the initial row of weird-looking triangles and been convinced that I was doing it incorrectly. But no, it really DID look that weird at the beginning. 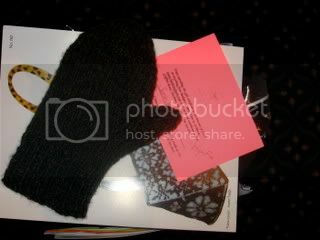 Plus, Margaret taught me how to knit backwards, so I don't have to constantly turn everything around for the purl row. That was a lifechanging thing to learn, let me tell you! And I find it fun and easy to knit as well -- just square after square, making it easy to pick up and knit for a short period of time and still have it look (and feel) like I actually accomplished something. What makes it a Voodoo Triangle? Well, there's the fact that entrelac is kind of voodoo to begin with, if you don't understand how it works -- it looks SO much more complicated and impressive than it actually is. But really, the voodoo is in the geometry. 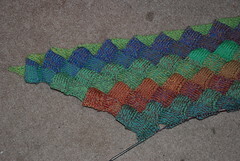 As I said, this is a top-down triangular shawl, and each row has one less square than the row before. And through the magic of math, while it looks like I haven't gotten all that much done, I'm more than halfway through the body of the shawl -- I did out the math, and (not counting the initial row of triangles) there are 300 squares in the shawl, and I've gotten through more than 160 of them. Amazing! Incidentally, this thing is going to be huge. Without any stretching or blocking, the top edge (which is the bottom edge in the photo above) measures over 60" -- my tape measures are all 60" long and it's wider than they are! 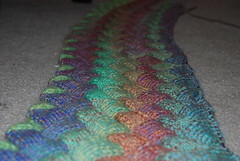 I don't think I'll block this severely, but still, it's not a small shawl. 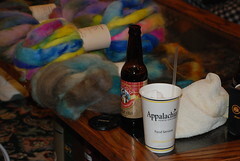 I'm just afraid that before too long, it's going to be too warm to work on, what with all that wool in my lap. No, seriously, I DID go away! March, as we have already established, somehow just evaporated into thin air. 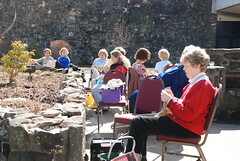 This means that I am close to a month late on talking about my annual Girls' Weekend Away - the Baskets of Yarn knitting retreat in Boone, NC! First and foremost, I want to be clear that my delay in writing about the trip does NOT mean that I didn't enjoy myself! ;-) It was, as always, an amazing weekend, and once again Betsey and her staff outdid themselves. Thank you, ladies! 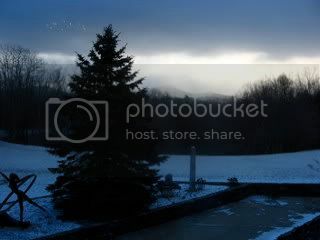 Now, they call this the Winter Retreat, but this year it was anything but! 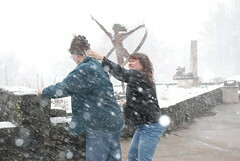 The last two years we've had a bit of snow up in the mountains over the course of our weekend, and the pre-retreat discussion in the BoY group on Ravelry suggested that everyone (well, at least the southern contingent of attendees!) was looking forward to the same this year. But instead, the weekend was a GORGEOUS taste of spring -- sunny and warm and beautiful all weekend. 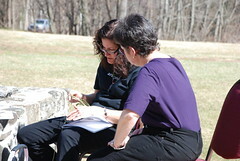 In fact, we moved some of our classes outside. I think most everyone had had their fill of snow by then anyway, so it wasn't missed -- even the South had had a significant snowfall just a week prior! It was such a wonderful weekend, full of friends, fun, food, and laughter. Lots and lots of laughter. And also fiber and beer. And did I mention the food? 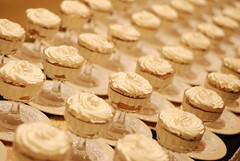 Specifically, the desserts? 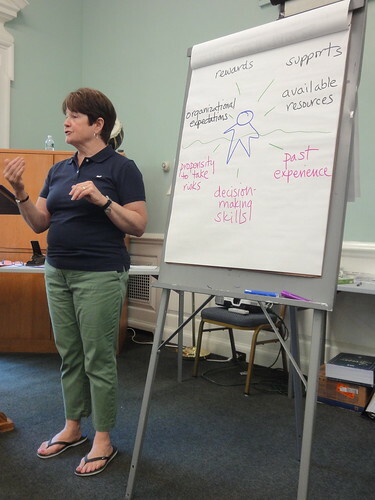 More of my photos from the retreat are here. And can I just say that I'm already looking forward to next year?! Egads. There's nothing quite as sobering as seeing pictures of oneself! Usually I'm the person behind the camera, so I don't get the pleasure (ha) of seeing photographic evidence of myself very often. I should keep it that way. ;-) It was apparently quite bright out when we took these pictures today, so I'm quite squinty on top of everything else. As much as I'd like to re-do the photo shoot with less squinting and a real smile (Jim is a fine photographer, but photographing people is not his strong suit! 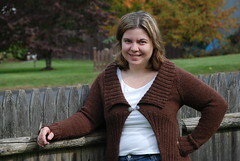 ), I've been putting off the FO post for long enough already, so here's my finished Tilted Duster! Time: March 2008 - October 2008 (with a long hibernation period over the summer). 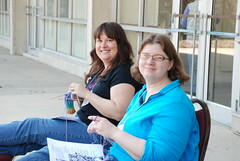 To recap, I started this at the Baskets of Yarn knitting retreat. I had a lot of angst deciding what size to make, but I'm very glad I opted for the smaller one -- the 44" would have been too large. I didn't make any modifications to the knitting itself, other than making the "skirt" part a tad longer than called for in the pattern (and a bit of sleeve modification, as described below). Obviously, though, I'm not wearing it as specified. With the collar turned up and buttoned, the sweater was too warm -- and it made me look even wider/bustier than I already am. 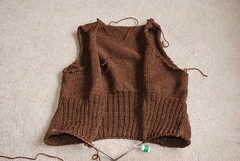 Luckily, modifying it to a shawl-style collar as seeen here was as easy as flipping the collar down and adding a clasp! The buttonholes are there in case I ever decide I want to wear it that way, but they are essentially invisible so there was no need to reknit the collar. My only complaint is that the sleeves are a tad snugger than I would have liked. 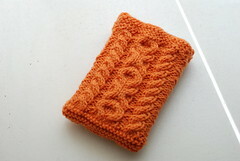 I read that they ran small, but not until after I was pretty far into knitting them -- and I didn't want to rip back! So while I started with the instructions for the medium size, I increased all the way up the extra-large and am very glad I did. I was also able to stretch them out a little when I blocked. All in all, I'm very happy with this. I think it's a versatile style, it's not too heavy/warm, it's reasonably flattering, and I love LOVE the color! Yay! 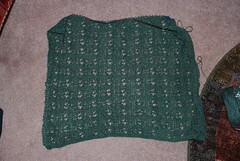 This is very VERY easy lace -- it's garter stitch and has a 12-row repeat, only four rows of which are patterned. And in a first for me, I have the pattern memorized. I can also knit on this while reading or watching TV -- in the past I've only been able to handle basic ribbing or simpler while doing something else, never an actual pattern. 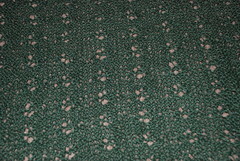 The eyelet pattern is supposed to look like little flowers. If I stretch it way out I can sort of see it, but I still think it looks more like cats' paws. This isn't a terribly good detail picture, but you get the idea. I'm plugging away at this little by little -- I went all gung-ho on it for a few days but now I'm back to the aforementioned secret knitting. Still, though, I'd like to have this done before we go on vacation. It seems like a good casual vacation wrap, no? At the retreat, those of us who were there from Thursday - Sunday got to take a nine-hour class, a six-hour class, and two three-hour classes. 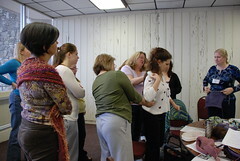 My nine-hour class was the Tilted Duster, from Interweave Knits, fall 2007. I'd been wanting to make this sweater for a while (well, pretty much since I saw it in the IK preview before the magazine came out!) 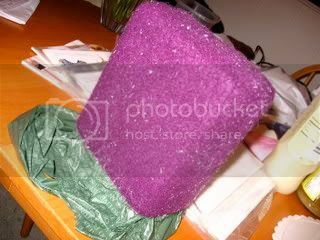 but I was a little bit intimidated by it because it's such an unusual shape and I wasn't sure how best to size it. Plus, I didn't have appropriate yarn for it, and I am trying really, really hard to knit up some of my sweater-quantities of yarn before buying any more. 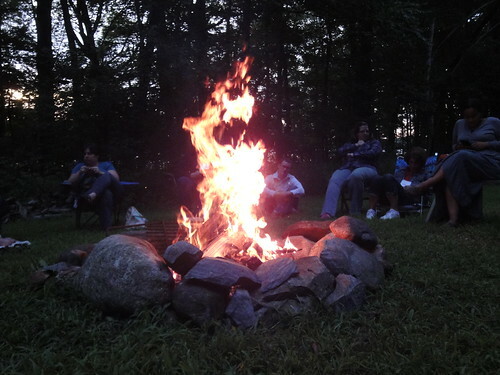 So it was really on the back burner, but when I saw that it was one of the nine-hour options at the retreat, I jumped at the chance to take it. In the three three-hour class sessions (one each day on Friday, Saturday, and Sunday) plus some out-of-class "homework" time, I managed to get through the upper body of the sweater. I cast on the back and knitted a few inches before deciding that the size I started with seemed too big, so I ripped it out and started over in a smaller size. This one seems closer to how I want it to fit -- possibly a bit snug (hard to say at this point because of the shaping) but we're knitting it in wool so I am expecting that it will stretch out a little, and also that I can block it out to measurements if necessary. Once the back and fronts of the sweater are seamed at the shoulders and the sides, you pick up stitches all along the bottom of the bodice to create the "skirt" part of the sweater. Jean actually suggested, and showed us how to execute, a provisional cast-on, as she felt it would be easier than picking up 200ish stitches. Ever the contrary one, though, I alone among my classmates (I think) decided to go for the picking-up-stitches option. First, I kind of like picking up stitches, though I can't really tell you why. :-) Second, I was afraid that the sweater might need that little seam caused by the picked-up stitches to help it hold its shape. Third, my fabric was nice and firm, so I wasn't too worried about the picked-up stitches sagging (another concern of Jean's). So. 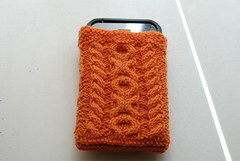 I picked up the stitches (made easier by the cable cast-on I used -- another skill I learned at the retreat!). I was four stitches short in each section, but during the first purl row and the set-up row I just created those "missing" stitches using a m1 increase. I know where they are and even so I can barely see them, so I think that worked out okay! 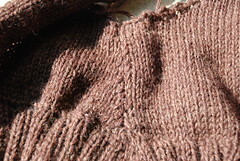 I also knitted that first purl row through the back loop to help firm it up a little. I'm very, very happy with how it turned out. It's a very solid and secure seam, and there is this little purl bump detail all the way around (hard to see in this picture, but as always, click to embiggen) that I actually really like. The yarn we're using is Universal Yarns Deluxe Worsted Tweed, a 100% wool. 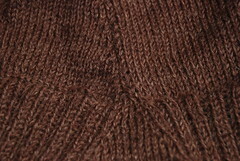 It's a lovely yarn -- it sort of reminds me of a cross between Brown Sheep and Cascade 220. 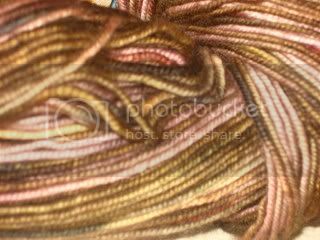 It's a thinner yarn than the recommended Berroco Peruvia, and I got gauge using size 8s (rather than the 10s recommended for the Peruvia). 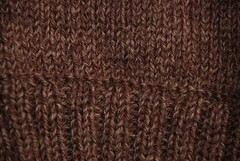 The color I'm using is "Mochacino," a lovely rich, chocolaty brown -- these close-up pictures are pretty accurate on my monitor. I love it! Anyway, I left the retreat having just picked up my "skirt" stitches and completed the set-up rows. 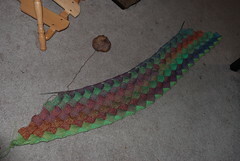 Since then, I've gotten about halfway through this portion of the pattern. I'm actually a little farther along than I was when I took this picture earlier today. This is a really fun pattern. I can't wait to get it done, and would love to be able to wear it, even if as outerwear, before it gets too warm in the spring. Right now I'm motoring along on it, but I do have some deadline knitting I need to return to...and of course there are the other retreat projects, which deserve some attention as well! So we'll see when it gets finished. I have some ideas for construction modifications on the top part of the sweater, too, and I'll have to sit down and work them out. Stay tuned! 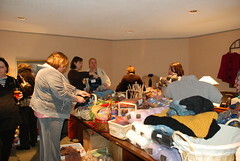 I thought that last year's Baskets of Yarn Winter Retreat was pretty much the best weekend ever. Well, I was wrong. I mean, it was fun and all, but THIS year's retreat was the best weekend ever! 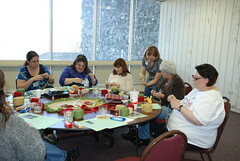 One of the classes I took was Jordana Paige's strawberry apron (from Knitty Gritty), taught by Jordana Paige herself! 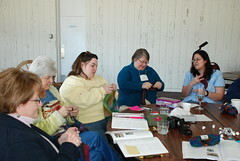 Here's some of the class learning how to do the daisy stitch motif. We all learned a lot in our classes. 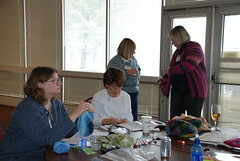 Here we are in the Tilted Duster class, learning about how to properly fit/measure an armhole. On Saturday, it snowed all day. 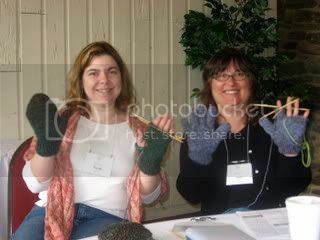 Last year Joan and I met so many wonderful women at the retreat. This year we convinced our friends Vicky and Sarah to come along too (and I hope someone has a picture of the four of us together, since I don't! ), which was SO much fun. And we reconnected with lots of people from last year and, of course, made new friends too. 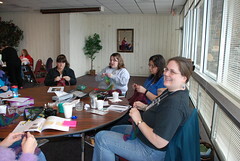 Last year I really regretted that we didn't really keep in touch with any of the ladies from the retreat, but this year Betsey is sending around contact info, and of course with the advent of Ravelry we'll be able to keep up with each other in that way, too. It was such a nice thing to be able to get to know so many fantastic women and share so many laughs and good times (and, yes, knitting tips and tricks, too!). I love all my new friends and I am just sad that I only get to see them once a year! 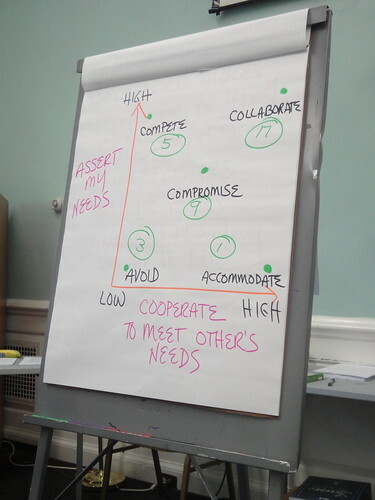 I'll post later with photos and details of the projects from the retreat, but for now I want to get this up. 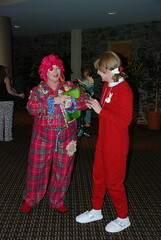 Thank you SO much to Betsey and all of her staff for such a wonderful weekend! I realized after I posted about the retreat that I didn't tell you about the goodies! First of all, when we checked in, we received a Bagsmith project bag. I LOVE this thing. So many pockets, and I LOVE that it's freestanding, too. This was practically worth the price of admission in and of itself. ;-) We also got these little silk Della Q project pouches. Again, LOVE. In fact, I loved these so much that I bought others in various colors...I'd like to keep them all, but I think they'll be good for swaps and whatnot too. Not the world's best photograph...but this is the Della Q bag (with cool color-changing iridescent fabric!) that I needed to own, and from right: Colinette Jitterbug in the Castagna colorway (I've been wanting this for some time, but no one local carries it); a skein of purple Berrocco Ultra Alpaca that I got in the yarn swap; a skein of pink Tofutsies, which I cannot WAIT to try out; three balls of Universal Yarns Tango (the yarn from the "yarn tasting" on Saturday night -- it knits up into ruffles); and three random skeins from the yarn swap. 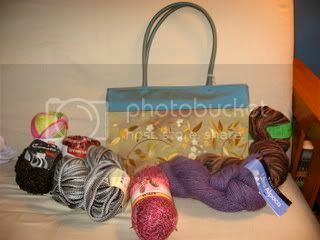 I also purchased a bunch of patterns and a kit for a beaded bag that I forgot to photograph. I just LOVE the color of the Jitterbug. 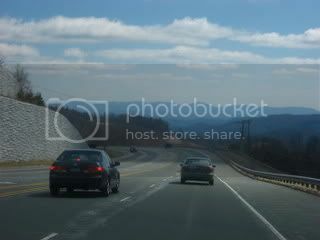 These pictures aren't entirely accurate, but they give you an idea. 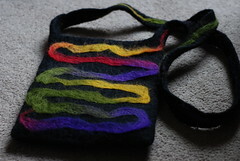 I felted the Noni bag today. 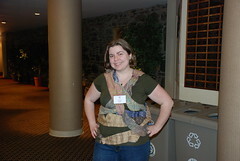 It took three cycles, which surprised me -- in the past when I've used Cascade 220, it felted after just one. 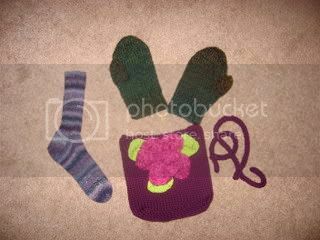 This was knitted with a double strand, though, so I'm sure that that had something to do with it -- it wasn't nearly as loose as other projects I've made have been pre-felting. As previously hinted, I went to North Carolina to a knitting retreat organized and run by the Baskets of Yarn shop in Charlotte. 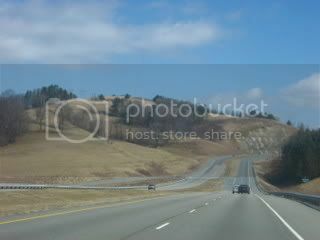 The retreat was in Boone, way up in the mountains, almost in Tennessee. I flew down to Raleigh-Durham on Thursday and met up with my friend Joan, who lives in the area. She showed me around her neck of the woods, and we had a yummy dinner (and beer!) for dinner, and hit the sack early for our trip out to the retreat. We arrived at the Broyhill Inn, site of the retreat, where there were already knitters everywhere (we had a choice of attending for three or four days and Joan and I had opted for the three-day retreat for reasons involving number of vacation days we had available -- though we decided within about a half-hour of arriving that we will make the retreat an annual event, and next year we will definitely go for the full time!). 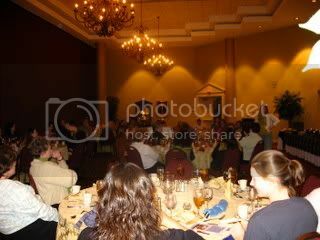 We had lunch at the buffet and then headed down to our first class at 2pm. 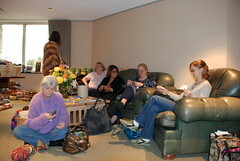 This was dinner on Saturday night...how can you go wrong with an entire room full of knitters? There were about 55 of us there, I think. And speaking of dinner, let me just say that the food was SO good there. Usually at conference centers, the food is eh at best, but that was definitely not the case here! I ate waaaaay too much over the course of the weekend. I mean, would you look at that? 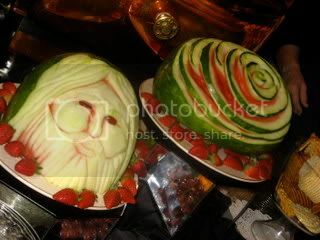 How could you go wrong with a place that had melon carvings??? 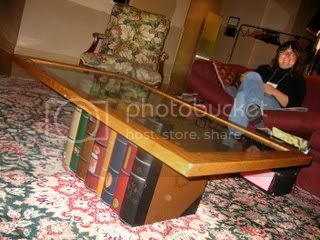 There was also some interesting decor....check out this coffeetable! (That's Joan in the background.) I want. 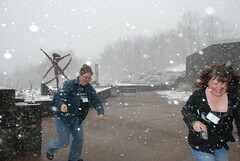 On Sunday morning, we awoke to snow! 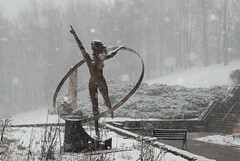 Would you believe that it was actually colder in Boone, NC than it was here at home while I was away? (Of course, then I came home to wind chills of -30F, but that's another story.) 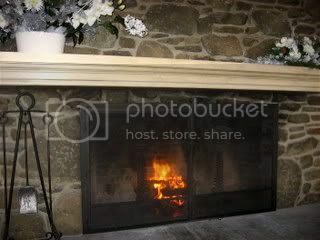 The cold weather, though, meant that we got to have the ambience of a fire in the dining room. And here are the two of us, in our last class on Sunday morning, showing off our nearly-completed projects.